Sales of Coke Life, Coca-Cola's lower-calorie variant, have tapered out in the UK, as the drinks firm admits the product needs more work. Coca-Cola Life was launched in September 2014 as a healthier alternative to regular Coke, since it is made using stevia, a natural source of sweetener. Boosted by marketing spend on its launch, the drink hit £4.2m in value sales after its first month on sale, according to IRI data. However, sales steadily declined in the following months, dropping to a nadir of £1m in the four weeks to 5 December last year. By the brand's own admission, Coca-Cola Life has put in a sub-par performance. Coca-Cola's chief operating officer, James Quincey, told Marketing: "We've always said this version of Coke Life is 1.0. We know that using stevia in products requires further development, and we know more extracts of stevia are coming in the future. "We're excited not just because we've been able to launch Coke Life 1.0, but that we know it's possible to innovate more on the formulae of this or other products in the next five to 10 years." Chief marketing officer Marcos de Quinto added that the new drink remained "a small part of our business". 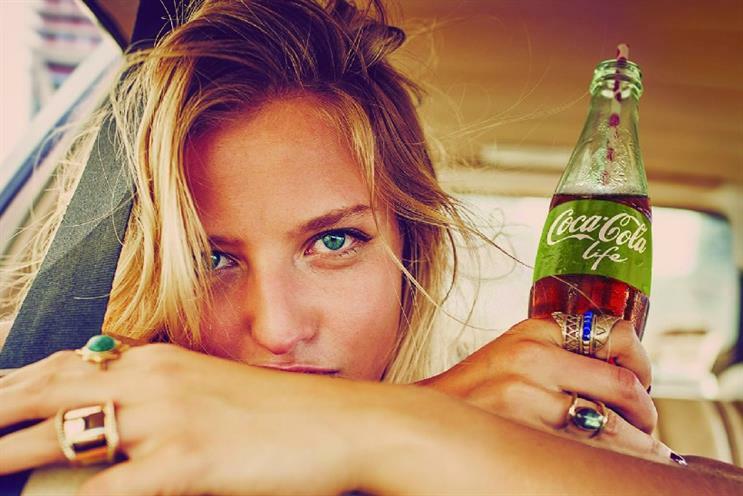 News of Coca-Cola Life's poor sales performance comes as Coke launches its biggest marketing shift in a decade, 'Taste the Feeling'. The company is hoping to boost sales of its low- and no-sugar variants, particularly Diet Coke and Coke Zero, in a climate that is increasingly hostile to sugary drinks. The UK version of 'Taste the Feeling' will focus on boosting sales of Coke Zero, which still represent a small proportion of Coca-Cola's overall sales in the UK. But what of Coke Life? Coca-Cola's marketing director for GB, Bobby Brittain, predicted that the stevia-based drink will be boosted from an increased association with the master Coca-Cola brand. "You get a first year, not as a freebie exactly, but where everybody is going to try it. It's your difficult second year which is the real challenge," he said. "We're now introducing the 'one brand' strategy, which Coke Life will benefit disproportionately from. It's the smallest of the variants and will therefore get the most energy. Increasing its footprint is the inevitable consequence of this strategy." Brittain added that he was encouraged by repeat-purchase rates on Coca-Cola Life, which were above the company's expectations. "Coke Life has a foundation of loyal drinkers," he said.